RALEIGH, North Carolina – The Jetta is an important car for Volkswagen, especially in Canada where it was their bread-and-butter model for a long time. Since it first launched in 1978, more than 600,000 units have been sold in our market. Of course, the brand’s SUVs are now the hot items, but that doesn’t mean the Jetta’s success isn’t less critical. Volkswagen purists will probably still remember the shocking introduction of the sixth-generation model back in 2010. The 2011 Jetta arrived in North America with a torsion beam suspension and drum brakes at the rear, along with the return of the company’s 115-horsepower, eight-valve 2.0-litre engine. However, those mechanical downgrades allowed VW to lower the Jetta’s base price to just under $15K in Canada, and sales soared, bringing new customers to the brand. Also: 2019 Volkswagen Arteon Finally Confirmed for Canada! That’s all behind us now. The 2019 Volkswagen Jetta, generation number seven, is built on the company’s MQB platform, a modular architecture that also serves as the basis for the Golf, but also the Tiguan and the Atlas. The Jetta was redesigned from the ground up—well, almost. It gets brand-new styling on the outside, although its design is unmistakably Volkswagen. The car’s grille is wide, and neatly blends in with the headlight clusters, while creases in the sheetmetal give the Jetta’s profile some welcome character. The trunklid tapers off nicely with a subtle integrated spoiler, but the chrome garnishes on the bumper of the high-end trims, which is meant to look like exhaust outlets, are totally bogus. Still, its appearance isn’t too funky, so it will likely age well, and alloy wheels are standard across the board. Under the hood, the previous-gen Jetta’s turbocharged, 1.4-litre four is back, now producing 147 horsepower instead of 150. Just a power rating revision on paper, says Volkswagen, as nothing has changed mechanically. The car’s 184 pound-feet of torque, which peaks between 1500 and 3500 rpm, makes the car pretty lively. 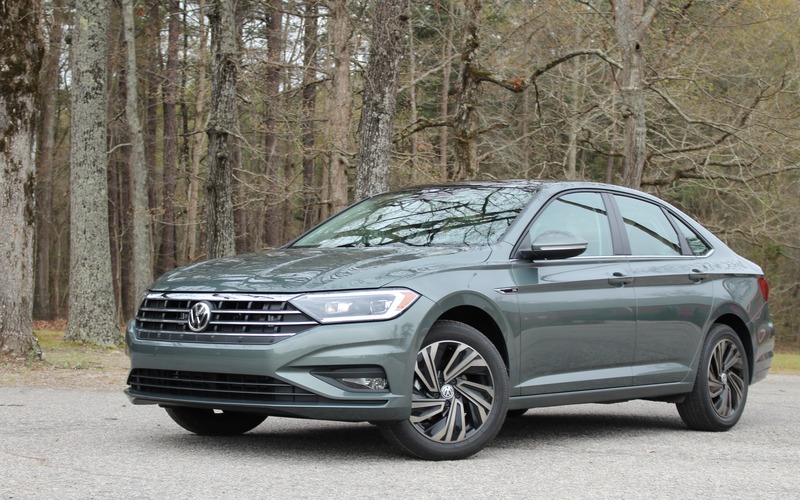 Along with a dynamic suspension setup and a stiffer chassis, the 2019 Volkswagen Jetta is fun to drive. We often found ourselves accelerating and turning street corners with more enthusiasm than we probably should have. That’s the difference between the VW and most of its compact sedan rivals. Fuel economy is now rated at 7.8 L/100 km around town, 5.9 on the open road and 7.0 L/100 km combined. That’s with the new eight-speed automatic transmission, which does an excellent job of rowing through gears swiftly and smoothly. Unlike many other brands that are only offering a manual gearbox on a base trim level, a six-speed unit can be specified in all three of the Jetta’s trims in Canada. We tried it, and it’s excellent, enhancing the car’s fun factor even more. The only trade-off is that its city consumption rating rises from 7.8 to 7.9 L/100 km. No problem, right? The car’s cockpit is redesigned, but here too, the appearance stays true to Volkswagen’s styling principles. Some plastic trim pieces look and feel hard, like in the Tiguan and Atlas, but overall, fit and finish is fine. The base Comfortline—the stripper Trendline and Trendline+ variants are gone—starts at $20,995 before freight and delivery charges, and includes heated front seats, air conditioning, a 6.5-inch touchscreen, a USB port with Apple CarPlay and Android Auto integration (and MirrorLink, if anybody uses that), SD media card input and four speakers. The mid-level Highline, priced at $24,095, adds a power sunroof, automatic climate control, an 8.0-inch screen, a CD player in the glove box and two extra speakers. The $27,695 Execline benefits from a new nine-speaker, BeatsAudio Premium sound system. The latter sounds pretty good, so why reserve it for the most-expensive Jetta? The Execline also features uplevel items such as a power driver’s seat, leather upholstery, ventilated front seats and a 10.25-inch, digital and configurable, driver instrument panel. Advanced safety features such as adaptive cruise control, precollision warning with autonomous emergency braking and lane keep assist are part of an option package in the Highline and Execline. An R-Line appearance package is available in the Highline, which adds 17-inch “Viper” alloy wheels, ambient cockpit lighting, sporty cosmetic details and a 15-millimetre suspension drop. What about a heated steering wheel and heated rear seats, features that can be found in many of the 2019 Volkswagen Jetta’s rivals? They will arrive later this year as a separate option package, so if those are must-haves for us, we’ll have to wait before buying a Jetta. Since we’re on the subject, the first units will be arriving in dealerships before the end of the month. The Jetta has grown in every way possible, including wheelbase as well as front and rear track. That results in slightly more interior room, except for front and rear legroom. The Jetta was once the limo of the compact sedan segment, but now its rear-seat foot space is the same what’s found in a Honda Civic and a Nissan Sentra. The trunk’s volume drops from 440 litres to 399, so it’s no longer the cargo-carrying champ either. As for the Jetta GLI, not details yet, but it will be reintroduced later this year. We’re expecting it to be equipped with the same 220-horsepower, turbocharged 2.0-litre engine as the Golf GTI. So, some minor complaints, but overall, the seventh-generation Jetta is a fuel-efficient, frisky and spacious sedan that serves up above-average driving dynamics without any compromises. 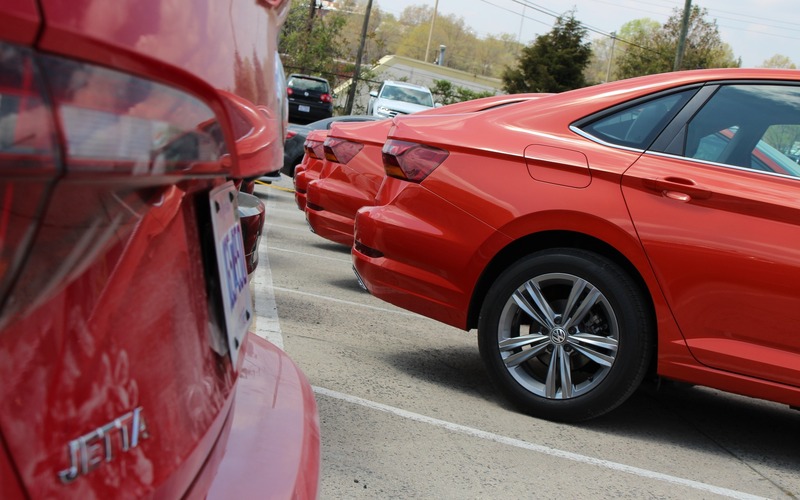 It might not knock the Honda Civic, Toyota Corolla and Hyundai Elantra off the compact-car sales podium anytime soon—which have a comfortable lead—but the 2019 Volkswagen Jetta will definitely give the Mazda3 and the Chevrolet Cruze a run for their money. 8/10	Its 7.0 L/100 km combined city/highway rating makes the Jetta one of the most efficient compact sedans on the market. 7/10	Quiet cabin and refined ride, but we wish the front seat cushions could be lowered a little more. 8/10	It’s no rocket, but the low-rpm torque makes for quick getaways and enhances the car’s fun-to-drive quotient. 7/10	Some touchscreen button zones are small, but the system is packed with features while integrating Apple CarPlay, Android Auto and MirrorLink. 9/10	One of the best handling compact cars, right up there with the Mazda3. 8/10	A compact sedan for drivers. Toronto 2019 Volkswagen Arteon Finally Confirmed for Canada!